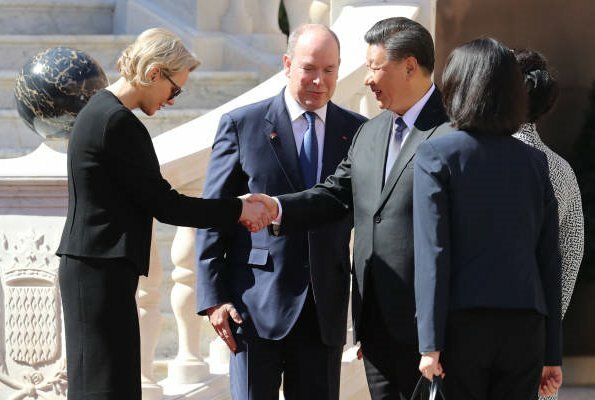 Prince Albert II of Monaco and Princess Charlene of Monaco hosted President Xi Jinping of China and his wife, Peng Liyuan, who made a state visit to Monaco. 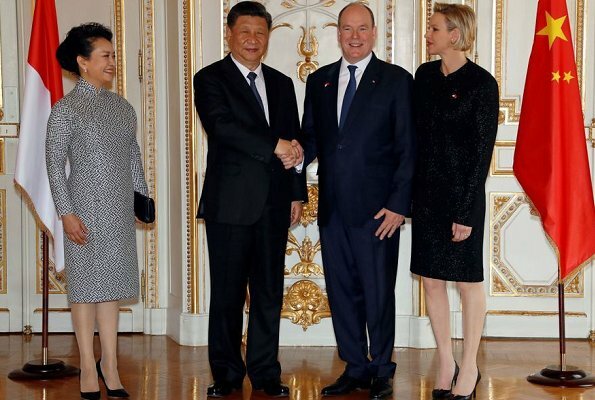 On March 24, Prince Albert II and Princess Charlene welcomed President Xi Jinping and his wife, Peng Liyuan with a state ceremony held at the Palace. 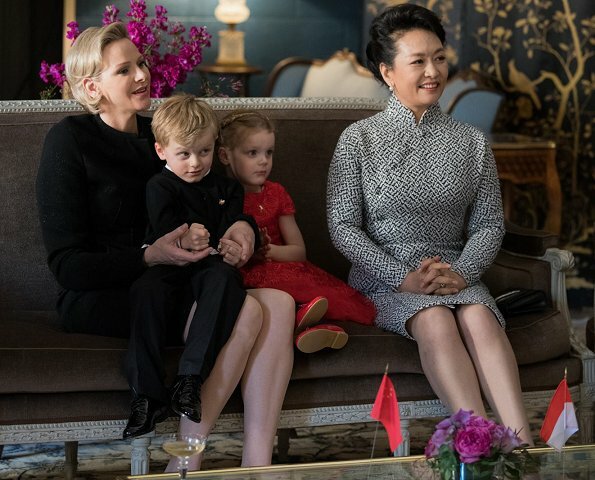 Afterwards, Princess Charlene and the First Lady attended a short performance in the Salle des Gardes by the Canadian violinist Zhang Zhang, who is of Chinese origin. 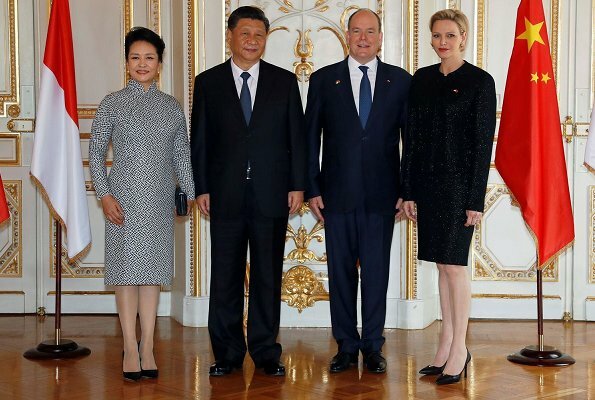 Prince Albert and Princess Charlene held an official lunch in the Throne Room (Salle Du Trône) for the Presidential Couple and the Monégasque and Chinese delegations. 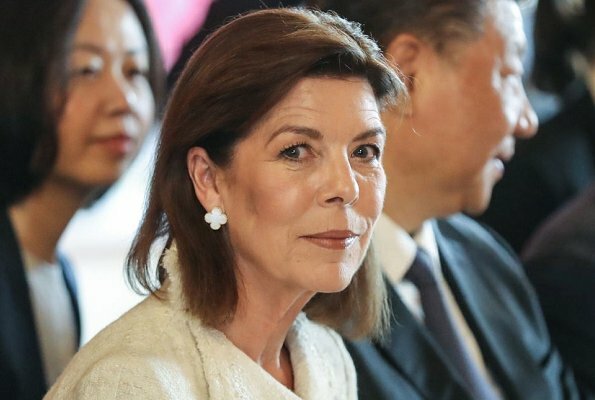 Princess Caroline of Hanover and Princess Stéphanie attended the lunch too. 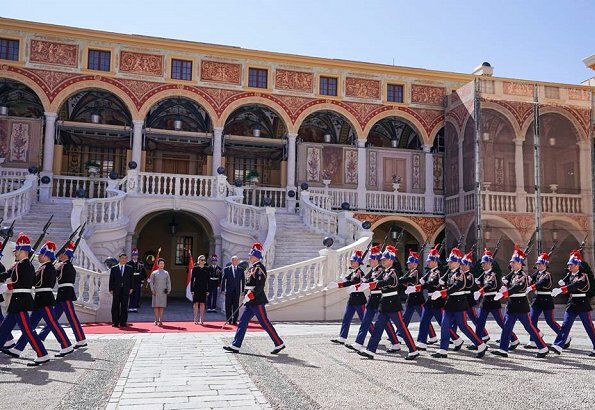 This was the first state visit made by a Chinese President to Monaco. 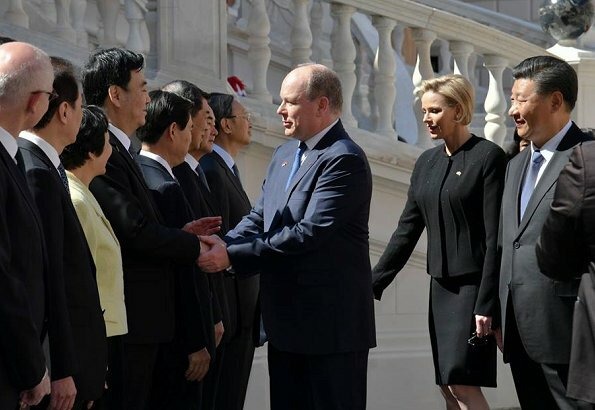 The purpose of that state visit was to strengthen the close relationship between Monaco and China. The diplomatic relationship between the two countries began in 1995. Ein sehr schönes, elegantes Outfit. Besonders gut gefällt mir aber Charlenes Frisur. Ein ganz toller Haarschnitt inkl. Länge. Weniger passend aber ihre Sonnenbrille (die gehört nicht aufgesetzt) und auch ihre Beine könnten eleganter stehen. 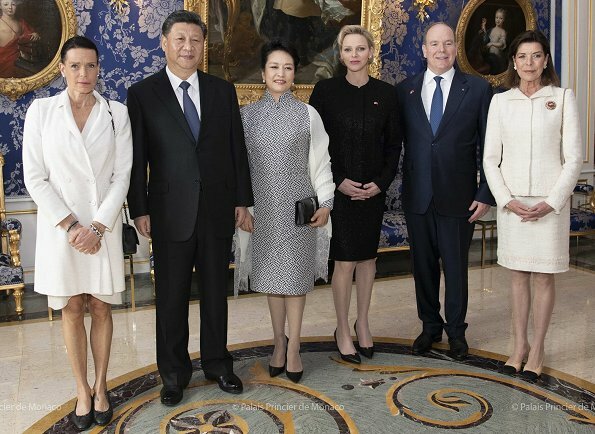 Und warum verbeugt sie sich als Fürstin vor dem chinesischen Präsidenten??? Agreed. And why the constant black, you would think it was a memorial service of some sort. And inappropriate leaning into Albert. Agree. A major faux pas. Agree. A major faux pas, although it appears she did take them off shortly after their initial meeting. Very correct dress, although a bit dark for the season and hour of the day...a bit of colour, should have been good.At least, I see her comfy in her role.I am happy for her!! 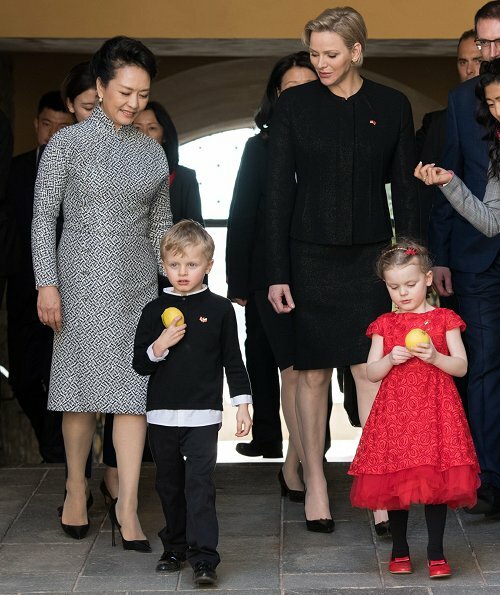 why is Charlene bowing to the Chinese president? Maybe he is investing money in Monaco . What has Caroline done to and with her hair? Nothing out of the ordinary that I can see. Its not in amazing condition and its caught behind her collar but i cant that its much different from usual. What do you mean? Yes, it's often like that nowadays. I don't think it's in fabulous condition and it seems to struggle to hold a style unless it's been professionally done. I think her hair has never been the same since her alopecia. 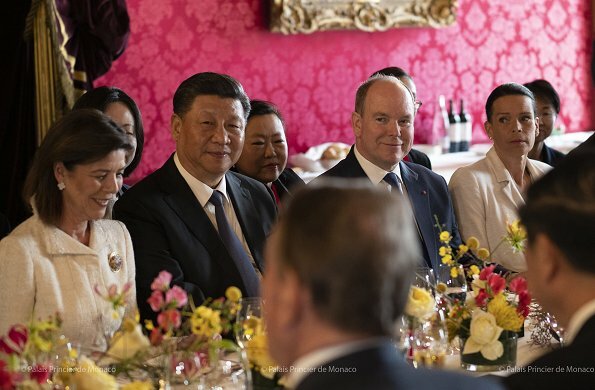 La douceur se lit sur le visage de cette princesse. Je suis totalement d'accord avec vous. 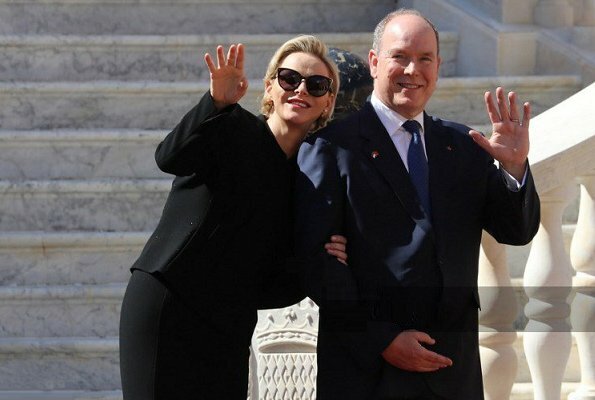 Prince Albert a réellement bien choisi; Charlene est charmante. She looks amazing. Just simple, luxurious and fabulously tailored clothing. Her hair looks good like this. It’s nice to see her so much more relaxed in public. 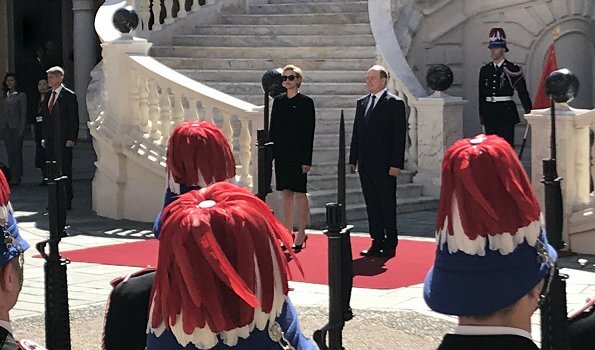 Charlene looks stunning although I think all black is slightly odd for a sunny spring day in Monaco. Nonetheless, a really sharply tailored outfit that looks lovely. Hair and make up also great. Best of all she seems relaxed and happy which really does make the difference. From what I can see of Caroline's outfit she looks good - looks like Chanel. Shame there was only a fleeting glimpse of Stephanie in a video - from what I could see she was looking pretty smart (and with her hair up). I think Charlene looks very elegant and her outfit fits her like a glove. I think she should have gone for a less somber and more spring-like colour though. I agree that her hair looks fabulous. 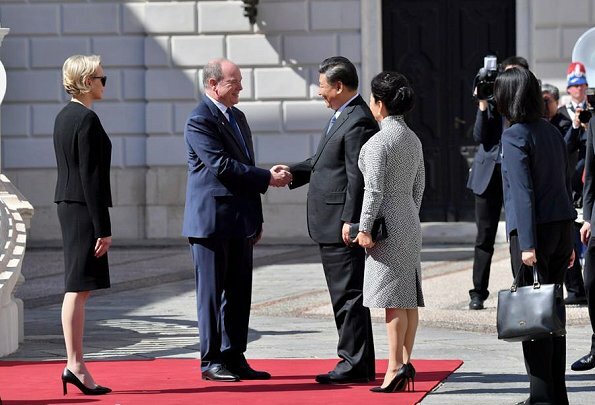 Regarding the sunglasses: I don´t mind them, and I don´t think it´s impolite to wear them when you greet foreign dignitaries. And the just happen to look very good as well. I can imagine though that she didn´t wear them as a fashion statement but out of necessity. In spring in particular, the UV-intensity is sometimes too much for the eyes. I think after initial strains and bad publicity, Al and Char actually in love. Doubt it. 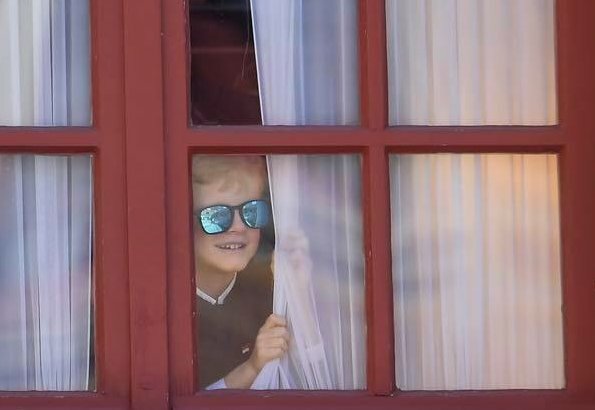 She got roasted on a blog for rude behavior in NY and Markle/Harry are getting attention with PDA. This was over the top acting. It was disgraceful in a First Lady. Sometimes people with light hair and skin have light sensitivity. So that may be why she is wearing sunglasses. Well, aren't you the lady, anja! Think what you want, some people do in fact have light sensitivities. I am one of them. I have no control over that. I don't know about Charlene. Black is not reserved for somber occasions or formal evening events any more. I agree that she might have looked more spring appropriate in a color, but her dress and jacket did look very nice on her. Charlene and Albert showing affection toward each other wonderful. I´m rather light sensitive as well. Very blond hair, light skin. On sunny days, especially in spring when my eyes aren´t yet adapted to the brightness after a long winter, I can hardly open my eyes outside without glasses, it´s literally painful to my eyes. If your options are to awkwardly squint, to stay indoors or to use sunglasses, I´ll always opt for the latter. @ anja, you are right. If Charlene eyes were sensitive to light she would wear sunglasses all the time being outside but she is not. What a totally uncalled for comment Anja - can't you express your opinion without swearing? Both First Ladies look great.Pss Charlene always stylish and elegant. 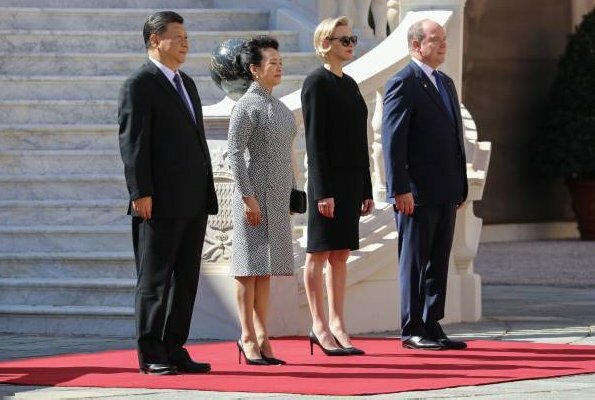 Madame Xi Jinping also looks her part perfect.About the sunglasses, maybe Charlene has very sensitive eye's so the glasses are fine.Hopefully we'll see photos of the Chines President and Madame, meeting Prince Jaques and Pss Gabriella.Pss Caroline looked lovely. 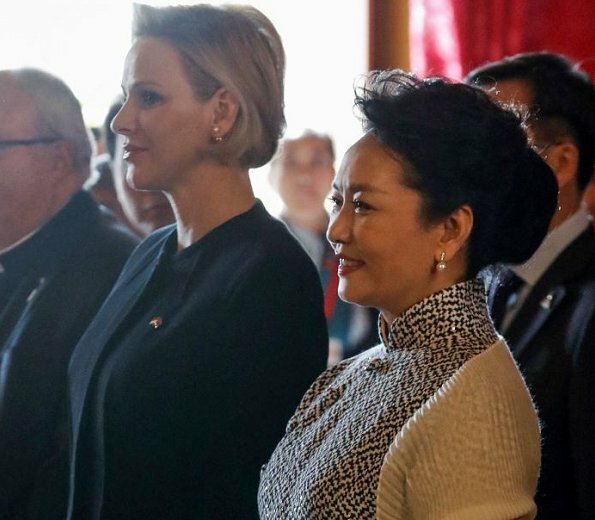 I forgot to say that the Chinese First lady also looks lovely - beautiful dress and shrug. Her hair is great. This is the best I’ve ever seen Charlene look! Love the hair, makeup and suit. 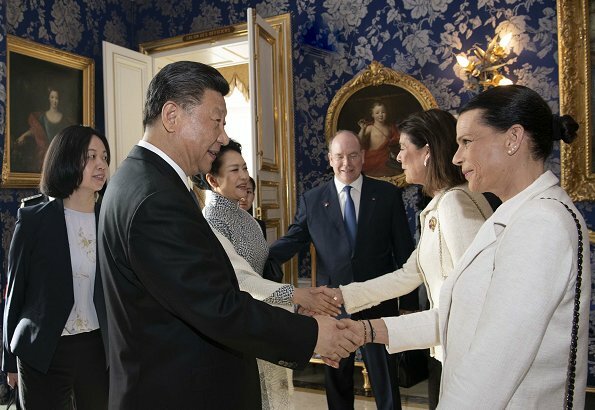 On another note, is she bowing to President Xi? De Presidentsvrouw is ook knap en mooi gekleed. They're in Monaco. 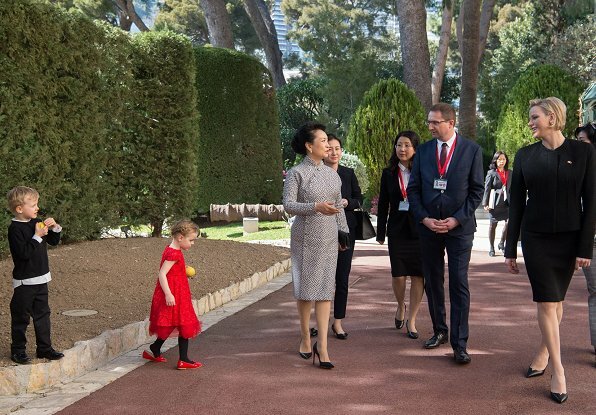 And Madame Peng Liyuan is wearing a white shawl/shrug. When you visit Asia, you must take that into account, when Asians visit Europe they must realize that here white has no such connotation. I'm sure that well informed Asians are well aware of that fact. Pic 8 ..un petit bandit..
Warum trägt die Fürstin schwarz ? Diese Farbe ist normalerweise nur bei Trauerfällen üblich und gerade bei einem Staatsbesuch sehr unpassend , trotz des eleganten Schnittes ! I totally disagree, when I first saw the photo with her sunglasses on, her hair totally coiffed I had to do a double-take. She looked like classic "Grace Kellyesque!!!" I do agree a lighter suit would be a better choice...As for Caroline and Stephanie I do think they could put more effort on their appearance considering how few events they attend. Caroline always makes sure to have her hair styled for the Monaco rose Ball. As for Stephanie I liked her hair shorter as it gave her a more androgynous look in a good way. 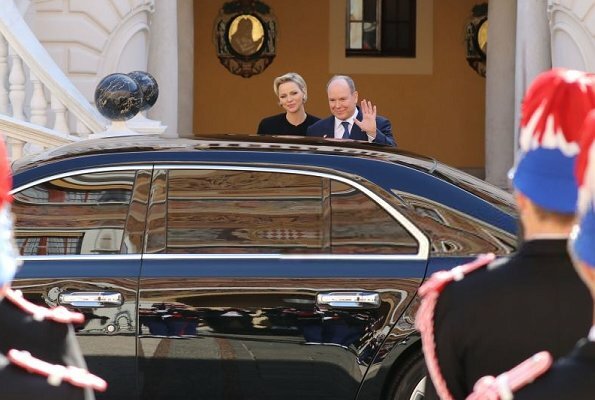 superbe princesse Charlène!elle est douce et ils forment un merveilleux couple.